Buy Justin’s newest book now! It’s a great book of slogans and practical business experiences. This book is a perfect christmas gift for clients and colleagues. It’s all a matter of attitude is a great motivational book of slogans perfect for all ages. Make sure you get a copy for yourself too! …5 of those people who heard me rave about your book, have purchased it, already read it, and their businesses, and their personal lives have already changed for the better as a result. Not only that, but THEY have raved about it, and passed it on to their husbands, who have already read it, and passed it on. And the girls I work with, are commenting on how motivated their partners are, and raving about the changes being made in their lives. With success behind him and more challenges in front of him, Justin Herald wants nothing more than to help others achieve greater heights within their own businesses and personal lives. Justin's corporate and motivational speaking allows him to share his past experiences and to motivate, inspire and excite. 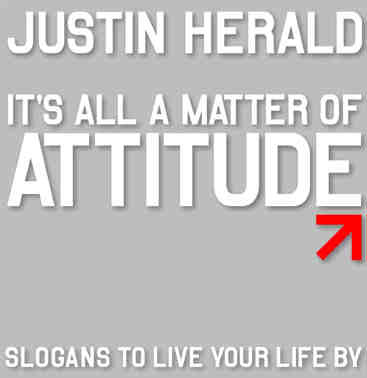 In addition to the success of Attitude Gear®, Justin has produced his own products. Justin first released his business/motivational book in April 2003. Within 3 weeks "Would you like Attitude with that?" hit the bestsellers list. Justin's much anticipated sequel, "So what are you waiting for? ", was released in May 2004 with an overwhelming response.